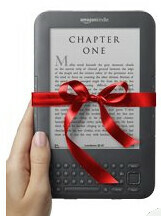 One of the hottest gifts this year is the eReader. Prices continue to drop while usability and features have steadily improved. If you or a loved one reads many books, the eReader should be on your list of gift ideas. So for those of you shopping for an eReader, which one should you get? What things should you consider with an eReader? Read on for advice on purchasing an eReader for yourself or as a gift. This question is becoming less asked, but I still hear it on occasion. Lets say the person you’re considering an eReader for reads many books each year. Will they like an eReader? Most of the time the answer is yes, someone who reads many books will LOVE an eReader. There are still those people who would rather have the “look and feel” of the paper book. But most of those people change their mind after using an eReader for a short while – not all, but most. Can I Borrow Library eBooks? If the person you’re considering an eReader for gets their books exclusively from the library, it gets a bit tougher. eBooks can be checked out for many libraries, but the selection is smaller and the supported devices are limited. Many libraries use Overdrive which has a pretty good list of supported devices. But the Kindle isn’t included. If this person is really focused on the library model of borrowing books instead of purchasing, go with the Nook over the Kindle. When someone asks me whether they should get an e-ink device like the Kindle or Nook or a tablet with an LCD screen like the Nook Color or iPad, I always ask this: Does this person read many books? If they do then the e-ink is really the better option. Much better readability (easy on eyes like paper compared to the glare and eye strain from LCD screen), much better battery life (read for weeks with e-ink device as opposed to hours/day on LCD device), and mostly lighter with e-ink over LCD. The con with e-ink is that it does books great, but isn’t good for magazines or newspapers or web because of the lack of color and poorer navigation. It should be noted that the e-ink devices are usually less expensive than the full-blown tablets as well. If this person you’re buying for reads more magazines, newspapers and web browsing and little books – the Tablet is probably a better option. Read the GeekTonic gift guide on tablets here. Which One? Kindle, Nook or other? There are currently three major players in the e-ink eBook world: Amazon has the Kindle, Barnes & Noble has the Nook and Sony has their family of eReaders. I’m not a fan of the Sony because I see them as slow to adapt to the ever-changing eBook world and while their devices are decent, their store and competiveness just doesn’t seem to be up to par with the other two. I recommend either the newest Kindle or the e-ink version of the Nook. The latest Kindle is the perfect smallish size with a very crisp screen, it’s super light and has the best UI of all eReaders in my opinion. I own the graphite-colored version of the latest Kindle and am very pleased with my choice. MrsGeekTonic owns the slightly older international version of the Kindle and our daughter owns the hand-me-down non-intl version of the Kindle. You won’t go wrong with the Kindle UNLESS you’re a serious library book borrower. The Nook (not the Nook Color with LCD) with the latest firmware is nearly as good as the Kindle – even better in some regards. It is supported by most eReader library collections and has a Barnes & Noble focus. The original Nook before some firmware updating had some issues that kept me from recommending it equally to the Kindle, but they’ve worked out those kinks and I recommend the Nook to those that don’t want to be locked down by the Amazon’s Kindle store and those who want access to your local library eBook collection. The Sony will be fine for some, but personally I recommend the Kindle or Nook over all else. And please stay away from most other eReaders you find in stores these days. For instance, you’ll find the Pandigital Novell at good prices and other wanna-be eReaders but you’ll be disappointed. If you’re getting an eReader get the best, not a device the owner will be dissatisfied with. I used to think 3G was a must-have. 3G gives you instant access to the online bookstore (Amazon Kindle or B&N Nook) wherever you get a mobile signal. This is a great advantage if you live a long way from a bookstore or travel outside of Wi-Fi locations often. But most of us (me included) will be fine with Wi-Fi only which is a little cheaper. These devices hold a LOT of books so why not load it up with several before travelling and then you don’t really need the 3G. Then again, if you have the extra cash I guess the 3G is a good idea. MrsGeekTonic reads several books a month. I go through spurts where I read several and other times when I just read occasionally. For both of us, the eReader is a great device. Economically it makes more sense for MrsGeekTonic, but for me its a convenience thing as well as the fact that reading from a super-light/small Kindle is just more enjoyable compared to a thick hardcover or paperback book. And not needing to pack multiple books on trips is an added bonus. The Kindle is also available in Best Buy, Target and Staples stores. The Nook is also located in Best Buy and many other retail stores.